China: Brexit Threatens to Tip Scale in Favor of U.S.
Subject: China: Brexit Threatens to Tip Scale in Favor of U.S.
Not only that, China fears a Brexit will grant the United States more free-trade market dominance. 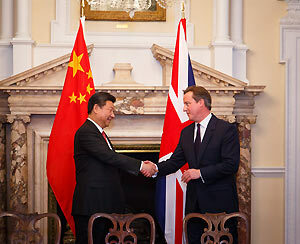 British Prime Minister David Cameron and Chinese President Xi Jinping at the UK-China Business Summit on Oct. 21, 2015. President Xi made no bones about his views on a Brexit when he visited the UK to make $61 billion-worth of trade deals in October 2015. One such transaction included granting China a one-third stake in a French-led project to build a new $34 billion nuclear power station on the remote hillsides of Somerset, England — a venture that banks on Britain's foothold in the EU. On the last day of his trip, Xi urged the citizens of Britain to choose to "remain" in the EU when they take to the polls on June 23. "China hopes to see a prosperous Europe and a united EU," his ministry stated, according to Financial Times, on Oct. 23, 2015, "and hopes Britain, as an important member of the EU, can play an even more positive and constructive role in promoting the deepening development of China-EU ties." Xi's statement was a rarity as Chinese diplomats typically abstain from making public proclamations on foreign affairs. His urgent words reflect Beijing's growing concerns that a Brexit would hinder European market access for the world's second-largest economy. In recent years, Great Britain has enjoyed myriad Chinese investments across various sectors: "From everyday consumer goods to an avant-garde civil nuclear project. No matter if it's eating one's Weetbix cereals or drinking tap water, getting a black cab or driving one's MG Rover to work, Chinese investments have already quietly entered the everyday life of nearly every single British household," wrote Dr. Yu Jie for the London School of Economics and Political Science earlier today. Without its EU membership, the UK would lose its attractiveness to these major Chinese corporations. What's more, according to Xi, a Brexit will have a favorable impact on the United States by reducing the EU's slice of global market share. "Chinese diplomats say Britain's potential exit from the EU worries Beijing, which believes free-market supporting Britain strengthens the EU, which China sees as an important ballast to American market dominance," reported RT.com on Oct. 23, 2015. You see, the United States is already set to gain $95 billion per year from a free-trade agreement with the EU, which will conclude by the end of this year. The UK would be excluded from this Transatlantic Trade and Investment Partnership (TTIP) if it leaves. And, in turn, China would lose its biggest trading partner in the west – its essential key to opening the gateway to Europe. Wouldn't this be a lethal dart to the major cellphone Giants? Maybe hedge some bets in that direction.